I'm working in Myanmar for the long term. My school pays for me to stay at a hotel (the local military here in Naypyidaw will not allow me to rent a house/condo). My hotel room is OK, but there are no cooking facilities. As part of my ongoing diet, I prepare a healthy salad for lunch at school ==> lettuce, red cabbage, green peppers, mint leaves, cucumber, tomato, sunflower seeds, a few mixed nuts, with a probiotic natural yogurt poured over the top. This tastes very nice. But eating the same salad on a daily basis for the next 5 years might be a little boring. The supermarket stocks a wide range of fresh vegetables and uncooked meats, (but zero brown rice, brown/black breads). The choice of kitchen equipment that I could use in my hotel room is very limited, but I found this item in the local shop. 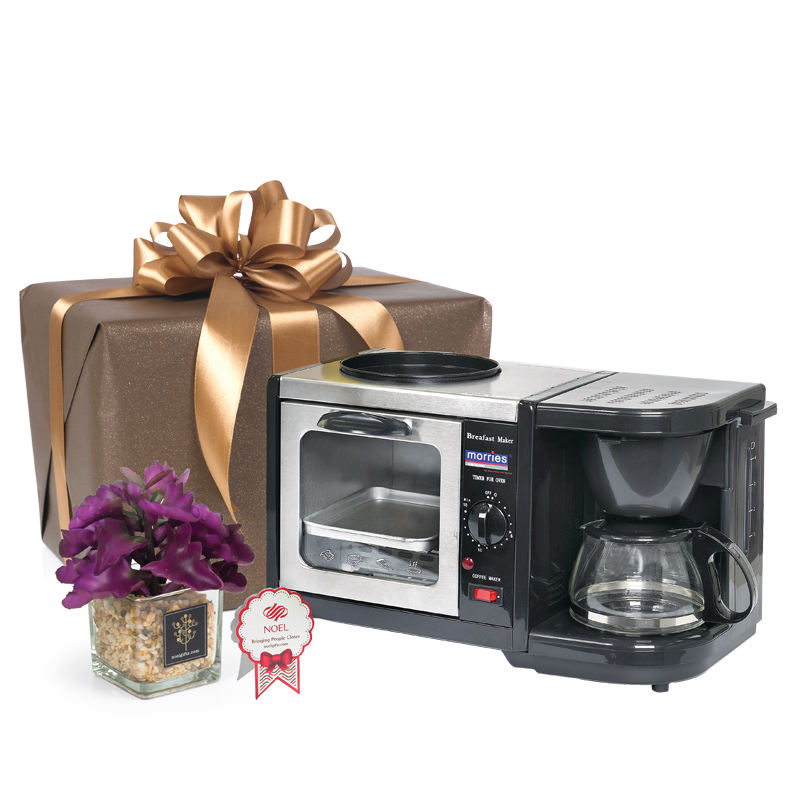 This is a 3 in 1 device, with a small toaster oven, a fresh coffee maker/warmer, and a teflon hot plate. My cooking skills are abysmal, but I'm keen to learn. Any suggestions what sort of one-person, healthy meals I could cook with this little machine? Omellettes are quick and easy, and wide choice of variations. These things are awesome, especially the mini oven. If you want healthy, roast vegetables or buy frozen ready-to-eat meals that look healthy. If you want yummy, you can make some nice pizza baguettes in there. I love to use these instead of a microwave as microwaving somehow destroys the nutrients... merely heating (not burning!) mostly doesn't. Big hint to use the oven - get some oven dishes which fit! Pre made meals aren't healthy. Make roasted vegetables, pastas with mushrooms and veg, grilled chicken breast, grilled fish, stir fried rice with veg, Thai style soups, lasagne, baked potatoes with fillings, mini pizzas, the oven is also great for bacon, grilled pork ribs in a Korean marinade and baked apples. All heating (cooking) of food destroys nutrients. Ready to eat meals are inherently less healthy, as is all re-heated food, because they have already been cooked once (losing some nutritional value in the process). But for sure re-heating something to 70C with normal heat is a lot healthier than having a microwave oven with its microwaves thawing the stuff with their huge power, pushing it past 100C and destroying a lot of nutrients? Reheat a slice of pizza with a microwave oven and a grill and see the difference. Same goes for eating cooled-down food after its been microwaved... inedible. Instead of asking what you can cook, it might be easier stating what you like to eat ? Because with an oven and a hot plate there is so much that can be made. Basically anything that doesn't require a deep fryer, really. But what I mainly eat is fresh fruit, raw green vegetables (lettuce, cucumber, green pepper), tomato, red cabbage, cooked chicken slices, natural yogurt, nuts. I will be honest and say that although this diet is tediously boring, I have never felt healthier in all my life! So with a little machine like this, I could cook vegetable omelettes on the hot plate, perhaps roast lean chicken with vegs, cook vegs such as broccoli, cauliflower etc. I need to experiment. What about the coffee maker? Can one use it for something other than making coffee? Given the diet, I would treat yourself to a steamer. Cheap and easy to get, you can steam fish or Chicken with vegetables , 20 minutes on the timer and the meal is done ! Highly nutritious simple and very healthy. Unlrss you like Coffee you could use that part of your set-up purely for hot water and infuse herbal tea, healthy and cleansing. I think you're better off buying a separate regular electric wok, coffee maker and oven.... maybe even a microwave... that little set up you posted looks too restrictive ..... plus if it breaks you lose all your cooking stuff in one go !!! Yes, I thought about a steamer, maybe more useful as you say. Maybe buy a steamer and a small, standalone toaster oven for grilled chicken and veg etc. Put some oatmeal,milk or water and some cut up fruit in a plastic food storage bag and boil it for 10 minutes in your electric tea kettle.